Tool, Jung, Qabalah, Qliphoth | Robert Mitchell Jr.
You see a post on Facebook. Some friend of yours has visited Jackson Hole, and there are pictures of mountains, barns and elk. You yawn and, because your friend seems so excited and you want to be considerate, you click in a quick “like” and move on. Six months later, while on a a trip out west, you get stuck at Jackson Hole Airport and there’s no plane out until the next morning. You figure, what the heck, you’re at the only airport in America that’s actually inside a national park. Why not go look around? You are floored. The scenery is incredible, the Teton Range are like no mountains you’ve ever seen before. Every barn, every elk, and every conifer glows with significance. You start snapping pictures with your cell phone, fully intending to put them up on Facebook as soon as you get back to the airport, because people have to see this amazing place. With an hour set aside to work on my forthcoming Qabalah book, I put every Tool record I own on shuffle and slipped on my headphones. The music played, and the words flowed, until Forty-six & 2 entered the rotation. My fingers froze. I had heard this song a thousand times. And although I always liked it, and could sing along through most of it, it was as if I was hearing it for the first time. I had long ago thought through the lyrics intellectually. I had read the Wikipedia article, already knew what the words meant, that the song’s reference to the shadow was supposedly Jungian, etc. But, I realized, when I had previously heard the song I had never seen the DNA of creation coming down through Kether, had never been forced to face my shadow at Gamaliel and felt a change coming through. I had not picked the necessary scabs. 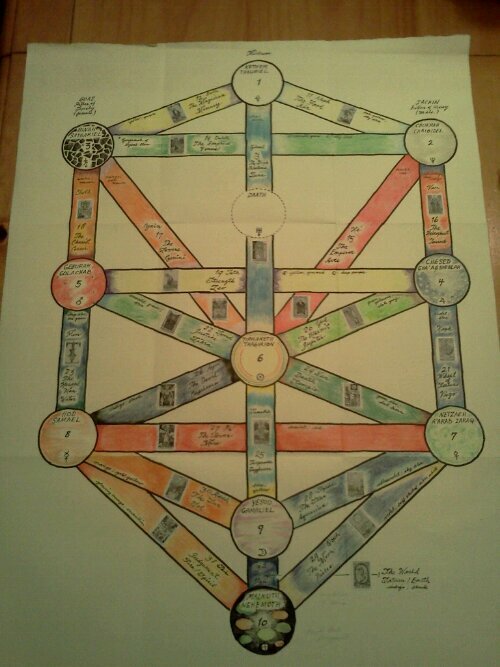 Now that I was hearing the song in the wake of my Qabalah project — pathworking the twenty paths of the Sephiroth and Qliphoth — the song was real. I was in Jackson Hole. The mountains were breathtaking, and so were the elk and the barns. In a sense, I am taking pictures and putting them on Facebook. And, most likely, you are going to give them a polite thumbs up and move on. But, if you want to know what Forty-six & 2 is really about on its deepest level, pathworking the Sephiroth and Qliphoth are an excellent way to make the discovery. This entry was posted in Mysticism and tagged jung, qabalah, qliphoth, sephiroth, Tool. Bookmark the permalink. Nice and real. And i love Tool. And nature mysticism. So, Like. Not the one where you politely hit it and move on so much. Just the Like for a moment shared where the otherworld seeps into this one. When a writer hears someone say that the message got through, that the words reached their target and delivered their payload, that’s the best feeling in the world. Your smart and honest comment has started my day off at it’s summit. Now I’m going to go follow your blog so that I can listen to you the same way you listened to me. Thanks so much. It’s my pleasure. Sharing beautiful words is one of our ways to be better at being human. Thanks for being found. Pingback: A Blunder, Some Hunger, and Feeling Younger | Robert Mitchell Jr.